The Keukenhof is known as the Garden of Europe, and if you've ever had the chance to walk through their green fields, you will truly understand why. 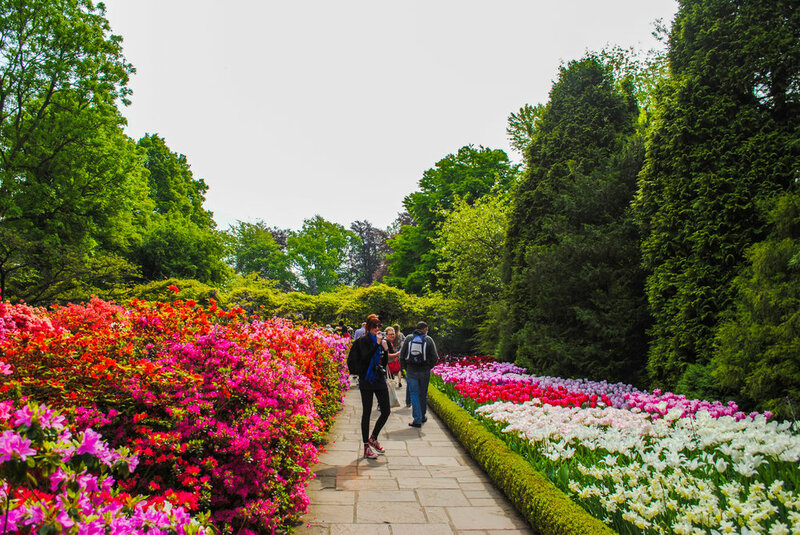 For two months every year, from March to mid-May, millions of rainbow coloured flowers (4.5 million to be exact) bloom over the 32 hectares of gardens inside the Keukenhof. They create what can only be described as a blanket of fantastical aromas and ethereal colours which cover the Dutch countryside. The Keukenhof is official open 22 March until 13 May as of 2018. Tickets can sell out on certain days so buying your tickets in advance is recommended. Booking in advance will also save you one euro. Adults cost €17,00 in advance and children are €8,00, kids under 3 are free. But the best thing to do is buy a "Combi Ticket" which combines your transportation with your admission. Saves you a bit of cash on either end and unless you have a car, you'll need to be riding public transport anyways. The prices are different depending on where you're departing from, but they range from €24-€30. The bus will drop you off at the main entrance to the gardens, couldn't be more convenient! The Keukenhof gardens were first established in the 15th century on what was then a substantial hunting ground. The name 'Keukenhof' means Court Kitchen in Dutch as the fields once served as a giant herb garden for the Queen's castle. Throughout the years, the various members of the royal family who inherited the manor continued to expand the garden, and in the 19th century, the Baron and Baroness Van Pallandt hired Jan David Zocher, a renowned landscape architect, to re-design it to create the unique and luscious garden the Netherlands had ever seen. As time went on, the gardens were bought by the city, and in 1949 the Mayor of Lisse decided to open them up to the public. He held an exhibit of flowers from all over the Netherlands and Europe. People were able to see, and smell, hybrid flowers not available in their local markets. They walked through incredible floral landscapes created by illustrious Dutch landscape architects. Since its public establishment in 1949, the Keukenhof has held the title as the world's largest flower garden as well as being the most photographed place on the earth. Today it houses more than 100 varieties of tulips, more than 2,500 trees in 87 types and 15 kilometres of walking paths. The date, more than 44 million visitors over the last 60 years have strolled through this real-life Wonderland. In 2018, the Keukenhof's theme will be Romance in Flowers. The tulips are the main feature of the flower garden. 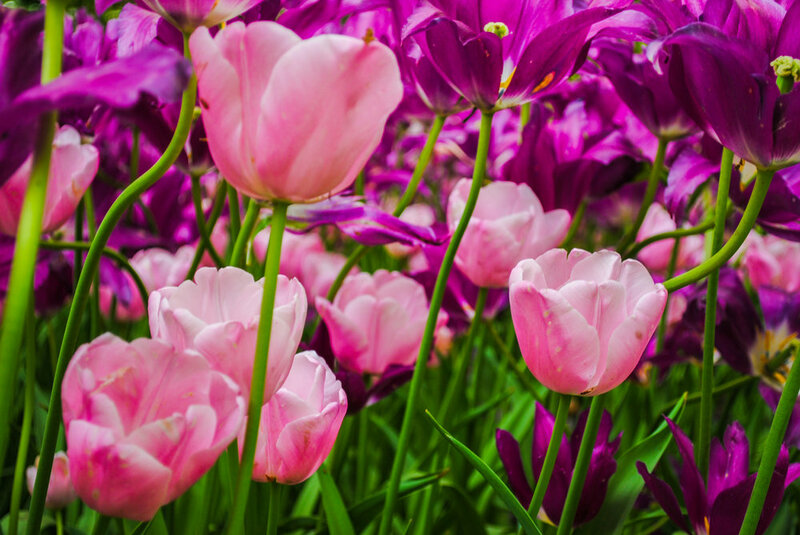 Tulips were first brought to Europe in the 16th century and caught on in popularity in the Netherlands. Tulips were able to stand the harsh temperatures and conditions in the Netherlands more than many other internationally imported flowers. Due to their resilience, Dutch botanists became avid collectors and even started to breed new varieties. Soon, everyone wanted a tulip garden of their own. Tulips became a status symbol for anyone who planted or who carried a bouquet as they walked down the street. Today they have become somewhat ubiquitous, but in the 17th century, they were worth their weight in gold. There are different groups and breeds of Dutch tulips. One is called the Couleren, which refers to the red, yellow or white coloured tulips. Then there is then Rosen, which are bright red or white with veining on the petals. The Violetten are the purple or lilac tulips, my personal favourite. And finally, and best named, is the Bizarden, which are tulip with odd or eccentric appearances. They tend to be brown with purpled or yellow veins running across a jagged petal. A virus was known to infect these tulips during growth and was called the "mosaic virus" which made the tulips bloom in vibrant colours sometimes with flame-like streaks across the petals. Although it was a virus, it was one that botanists cultivated since those features were more and more desired by buyers for their bizarre appearance. Our journey to the Keukenhof was rather simple. We had purchased our tickets online to avoid waiting in the line, so we quickly bypassed the waiting patrons and headed in through the main gates. We arrived as early in the morning as we could since it meant we had more of the park to ourselves. As soon as we stepped through the door, we were amazed by the colours and the overwhelmingly Dutch atmosphere of the gardens. There was an old wooden crank organ sitting in the front beside the fountain and the bright, rosy-cheeked Dutch boys and girls playing their instruments guided us with their music inside. As we walked through the garden, we noticed right away how different the tulips were from the ones at home in Canada. We saw marbled petals, radiant shades and extremely tall stems. Before stopping for breakfast, we found a giant chess set and, as is somewhat of a tradition for us whenever we see one, set out to play each other. I started out in the lead, but at the end of the match, Sarah was the clear winner. We had drawn quite the crowd, I'm a very loud and vocal person, so I'm bound to draw people in. After our game, we gave the pieces to the next players and found a small picnic table to eat our breakfast on while watching the other people pass by, smiles on their faces as they took in all the jewel-toned flowers spread out around them. The hedge garden and maze was a lot of fun. We wove in between the thick bushes, discovering sinuous sculptures dotting the area. As we strolled through the garden, we found a small petting zoo with tiny horses and cows. Children were laughing as they reached their hands over the edge to pet the fuzzy little creatures. Then, it was off to visit the main feature of this Dutch Disneyland; the Windmill. We climbed up the windmill to get a better look out over the fields where the tulips are initially grown before getting moved to the gardens. Our next stop took us away from the array of tulips and into the "Orchid building". Orchids are amazing flowers. They look so strange and almost otherworldly. We left the orchids and continued throughout the grounds. We past by what can only be described as a "Barbie's Dream Greenhouse". The bright pink and red flowers were almost blinding. I had never seen anything like that before. Thank goodness we brought our sunglasses! Tulips are the main attraction, but there is also a Japanese garden, a sculpture garden and even a lily pad garden where they added fake lily pads underwater that you could walk on. They sat just below the water, so the children playing appeared as if they were walking on water. People seemed to come here not just to see the flower but to be inspired by them. A man had his easel out and had just begun to sketch out his next masterpiece as we passed by. Perhaps a symptom of partying too hard the night before in Amsterdam. But as soon as they saw the flowers their tired and lacklustre expressions turned into enormous smiles. They ran like kids throughout the rainbow pathways, the photographer screaming at them as they went to stay together. No matter who you are, how old or how tired, this place seems to cast a magical spell on anyone who enters, and it is not to be missed. Make sure you make an effort to come and visit if you're visiting Amsterdam during the Spring - you won't regret it!